A major purpose of corporate events is to bring people together to cultivate social cohesion whilst giving them space to for personal experiences. A strong theme really helps in providing a center of gravity for the event. Whether celebrating a milestone or reinforcing your company’s objectives to foster further success, a strong theme makes all the difference. One important aim, particularly for conferences and networking events, is to create an environment that engages your attendees emotionally and intellectually. Not only the content of the event, but the setting itself must be relevant and unique so that it inspires, stimulates and opens people up. More and more meetings and conferences are creating separate, smaller environments within the meeting space for the exchange of ideas – whether formal breakout sessions, or places to have conversations. Our tenting and décor is a powerful tool to pull your corporate event together. 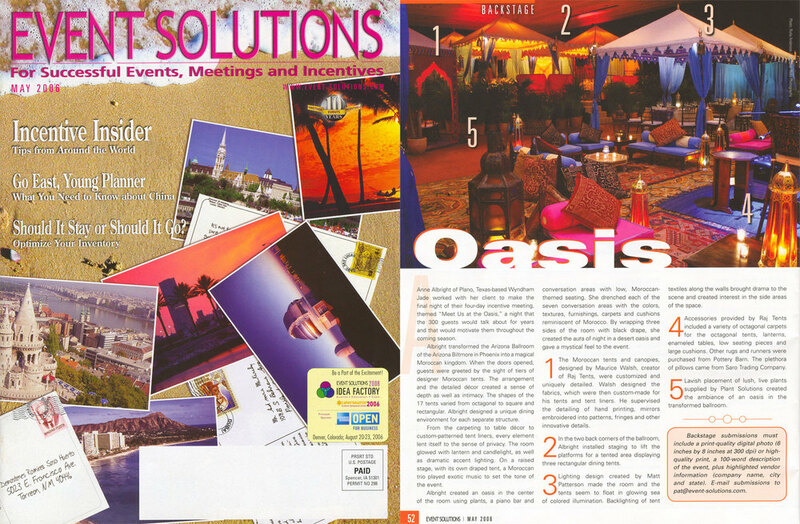 Check out our Themes and Destination Events pages for more ideas. Our luxury tenting and décor is a great fit for corporate events of all kinds, whether conferences, trade shows, networking events, opening Ceremonies, VIP events, award ceremonies, executive retreats, corporate parties and, of course, corporate holiday parties. We have worked on corporate events on many scales, locally in California, across the United States and abroad. Whether your mission is to transform a convention center or resort hotel, our extensive inventory of luxury tenting and décor creates a distinctive character for your event.